Just a few days ago we completed the installation of a major commissioned watercolour in its destination, in a private collection in Britain. 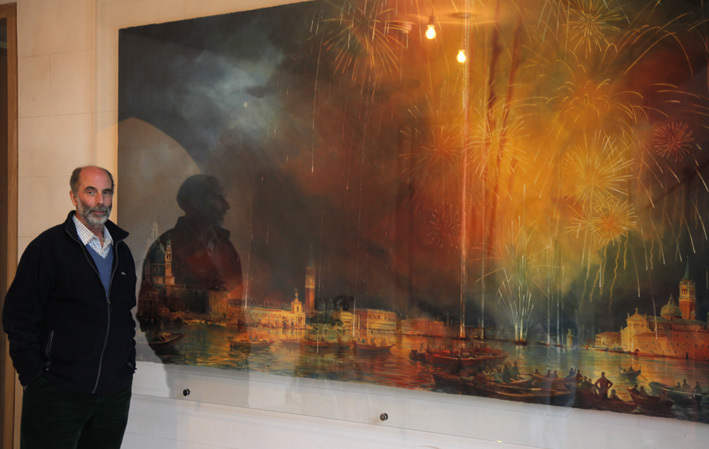 The ‘Redentore Fireworks over Venice’ had been the result of a discussion between artist and patron, and blended beautifully the aspirations of the one with the opportunities of the other. It was to be the largest watercolour I had painted, conceived over a kitchen table in Sussex, born in my little boat in Venice and brought up in Watts’s Great Studio in Surrey. It is a work which I had wanted to get my teeth into on a pioneering scale but which I could never have justified painting speculatively for the open market. It is also a work which the patron would scarcely have imagined possible and would never have found in a gallery. The result surprised both of us. Such is the power of patronage. A few weeks earlier I had made a last-minute dash to see the ‘Turner in Sussex’ exhibition at the National Trust’s Petworth House. The National Trust, as institutional guardians of our heritage, tend towards the cosy reassurance of our cultural identity rather than providing inspiration for its onward development, and this exhibition at Petworth House gave me a sturdy reminder of the role of patronage in art. What leapt out at me on that cold grey day, was the set of four later Turners commissioned by Lord Egremont for the Carved Room, luminous sunsets over the park right there outside the windows. They shone out of the gloom, striking and incongruous in their modernity. They signal Turner’s mature departure from the merely topographical into the purely ethereal in painting. As the great aesthete Kenneth Clark said of this period in Turner’s work, “the idea that the world is made up of solid objects with lines around them ceased to trouble him”. Rather what I had felt about the Venetian fireworks. Turner had been aged 54 when he painted these, roughly my age, approaching the peak of his career. The point of patronage, it struck me there in the Carved Room, was way beyond simply buying paintings, or commissioning views of interest to the patron, which are sometimes achingly dull to the painter. “Remember…” says a sign I once saw in a pub, “…Children & Animals are only of Interest to their Owners!” That applies to houses too, painted for pride not posterity. The powerful patronage that Turner enjoyed from Lord Egremont – his super-patron – provided an enablement where the artist was given abundant opportunity, hospitality, place, society and yes, money too. This enablement was benign and not proscriptive, in other words the super-patron enables the painter to pursue his own development, on a copious scale and, importantly, over a long period. The relationship between them generates immortality for both, certainly in the case of Egremont & Turner. For me the art is in the creation, not just in the idea. Creation has to have inspiration, love of the subject, knowledge and commitment. And ability of course. But art needs a midwife, someone who brings it into the world safely while looking after its creator. That is the role of the patron. So what qualifications does a patron need? A sensitivity to beauty, a hunger for excellence and sufficient knowledge to identify excellence when he or she sees it, a willingness to gamble perhaps and an interest in immortality. Oh, and adequate money! Roll up, roll up! We hung the ‘Redentore Fireworks’ in the hallway of its Elizabethan house, a former carriage entrance enclosed to make an entrance hall with a modern staircase built of glass. This was never intended to be a traditional watercolour, framed conventionally. Instead we enclosed the 5 x 10 foot sheet of paper between two sheets of oversize glass and suspended it a few inches away from the wall, the deckled edge of the paper casting its own shadow, the only ornament in the space. Stark modernity, bold and striking. Finally we stood back to see the painting in its intended space, the fireworks shooting up the stairs to the right and the calm of the full moon beckoning towards the dark courtyard on the left. It was the final keystone in the project. Painter and patron delighted, I realised it was one of the most important milestones in my career, to date. So what’s next? I have in mind a triptych of very much larger watercolours which will enable me to push the boundaries of expression and of technical ability. I am also researching the composition of a large architectural ceiling painting in watercolour, and exploring the possibility of an expedition to Central Asia to tread the dust of the Silk Road. The next few months should reveal some exciting new work! We shall see.